Microsoft Office Specialist World Championship is conducted by Certiport in partnership with Microsoft to test the MS-Office skills of the students. Top students are selected from various countries across the world to participate in the Microsoft Office Specialist World Championship 2016 to be held from August 7 to 10, 2016 in Orlando, Florida, USA. These exam categories will be known as ‘Exam(s)’. The candidates have to take any of these Exams from an approved Certiport Authorized Testing Center. The last date to register is June 15, 2016. The exam can be taken only in a limited number of languages. The list of languages will be updated soon. Age Limit: Participants must be aged between 13 and 22 years as on June 15, 2016. They must be currently studying in an institution approved by a recognised board/university. Participants from previous year can also participate this year. But if they had participated in MOS Word, they can participate in either MOS PowerPoint or MOS Excel. Employees of Microsoft, Certiport, or any of their partners, or their relatives are not eligible to participate in the Championship. Register just before taking the test: Students have to take the test in any of the Exams from an authorized ACADEMIC Certiport Authorized Testing Center. Register just after taking the test: They can also register any eligible Exam after getting the passing score by logging into the Candidate’s homepage. To register, they have to click on the Microsoft Office Specialist World Championship link and follow the instructions. Students can take the exams more than once in a day, provided they don’t violate the terms of the Certiport exam retake policy. But if they qualify for participating in Regional/Country round or the Final round, they can appear for the exam in only one of the Exam tracks, i.e. the track in which they have qualified. 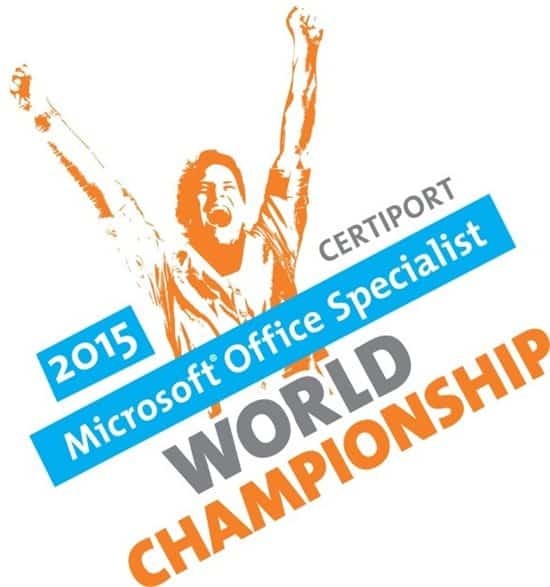 Option to Register for Championship while taking the Exam: Students will be asked to participate in the Microsoft Office Specialist World Championship 2015 via a dialog box which appears on the screen while sitting for the exam track in MOS 2013 Excel, Word or PowerPoint or MOS 2010 Excel, Word or PowerPoint tracks. Choice to Opt Out of the Championship: He/she can also choose to not appear for the Championship by removing the tick on the checkbox. If the student has passed the exam, and has not removed the check on the box, he/she has now entered into the Championship. Certiport Solution Providers will now contact the qualifying students and give them further information for the next round. Some countries also conduct a Regional/Country wise Championship as a qualifying round for the World Championship. Test on the Respective Tracks: The Regional/Country Champions will be tested on their respective tracks in a proctored lab. Although the test is completed in one round, sometimes a second round can be conducted. Tie Breaker: If there are two top scorers, then the final winner will be selected on the basis of the time factor. The candidate, who finished the test in lesser time, will be the winner.